In addition to making people happy with their delicious taste, cookies often have very interesting stories to tell. Studying the etymology of a specific cookie's name and reading about how it came about can also tell us a lot about the history, customs and beliefs of a particular culture where the cookie is invented or commonly eaten. This surely makes everyone love cookies even more. In the United States (U.S.), December 4th is National Cookie Day. You can also visit the National Cookie Cutter Historical Museum in Joplin, Missouri. Cookie cutters were first created in the early 1700s by American smiths. Cookie jars, used to store cookies, were first used during the Depression (economic crisis) in the 1930s, when American housewives started baking cookies more often, as this was cheaper than buying them. 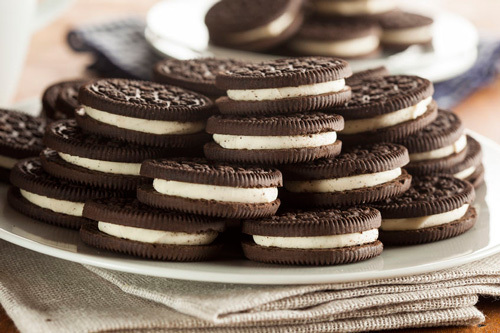 The most popular cookie in the U.S. is Oreo, a chocolate sandwich cookie bought in supermarkets. Each year, Americans spend more than $500 million just on Oreo. This delicious sweet roll filled with fig paste can be found around the world, although it originates from ancient Egypt. Figs were first used as snacks in Anatolia, today's Turkey, from where they were traded by sailors to other countries, including Egypt. There, fig rolls were developed in order to preserve figs in the pastry and store them for long-distance journeys. The fortune cookie might not be the healthiest cookie ever, consisting mainly of flour, sugar and vanilla, but is definitely one of the most beloved ones. Contrary to the popular belief, these cookies were not invented in China, but in the U.S., inspired by Japanese cookies called omikuji. 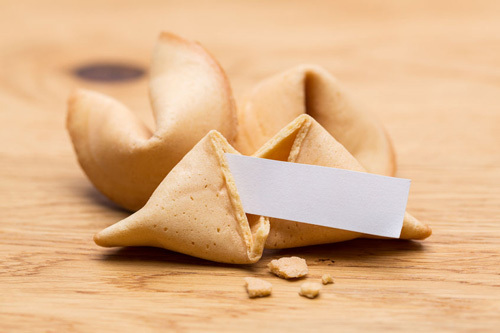 Several people of Japanese origin living in the Los Angeles area made simultaneous claims that they were the first ones to make these cookies which contain a piece of paper, the so-called fortune (a person's future) or advice, inside. The paper is supposed to make a prophecy to the person eating the cookie. Shortbread is a thick cookie made of flour, sugar, and a lot of shortening. Shortening is fat (such as butter) that is used in baking. The popular caramel shortbread cookie builds upon the classic shortbread cookie base with its soft caramel filling and a chocolate topping. It is commonly known as "millionaire shortbread" because of the rich variety of ingredients it includes. Although it originates from Scotland, it became popular when it appeared in Australian cookbooks in the 1970s. When it first appeared in Scotland, shortbread was very expensive so it was reserved for special occasions such as Hogmanay (Scottish New Year's Eve). However, nowadays its ingredients are not pricy so everyone can enjoy it. Originating from the 9th century Italian monasteries, macaroons are one of the oldest cookies in the world. In Italian, "maccarone" means "paste", which refers to the almond paste which is macaroon's main and most original ingredient. In Greek, the first part of the word "makar" means "blessed, happy", which perhaps explains why macaroons are so popular. 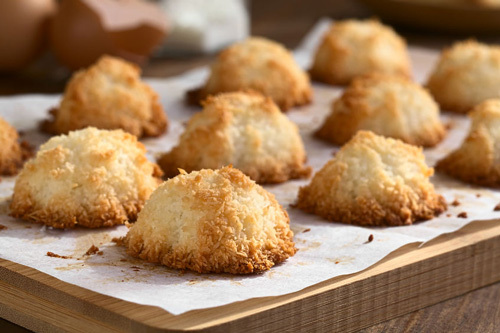 Made from ground almonds, coconut and other nuts, macaroons have no flour or leavening (a substance, especially yeast, that is used to make dough rise and become light). For this reason, they were adopted by Italian Jews as a perfect snack during the eight-day long Passover holiday. There is another famous cookie with a very similar name. Made from egg whites, sugar and food coloring, two macaron cookies are joined with jam filing or ganache (chocolate and cream). The name has the same origin as the macaroon cookie, but a slightly different history. First produced in Venice, Italy, macarons spread across Europe in the 18th century when two nuns seeking asylum in France baked and sold macarons in order to pay for their accommodation. Nowadays, they are one of the more expensive cookies, and usually come in many different colors. Several legends about a female character called Madeleine are attached to this delicious French cookie. While some say she was the cook of King Stanislaus (the last King of Poland), other believe she was a pilgrim who brought the recipe back to France from one of her journeys. 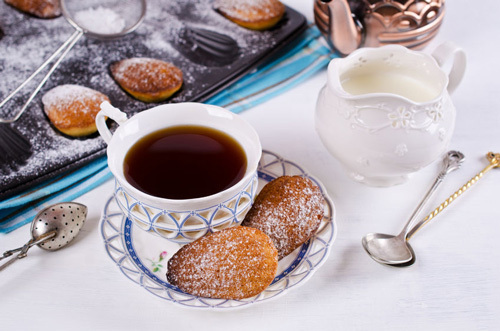 In any case, madeleines were first prepared in the 18th century, as metal molds were introduced to European baking. The madeleine is a small sponge cake made with ground nuts and lemon zest. Thanks to special madeleine pans, this cake traditionally comes in the shape of a shell. 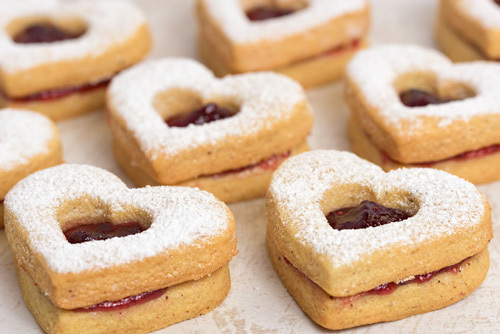 A petit four is a small bite-sized decorated cake or cookie. The name is French, meaning "small oven" (as historically bakers would use the lower setting on their ovens to cook delicate cookies and cakes). 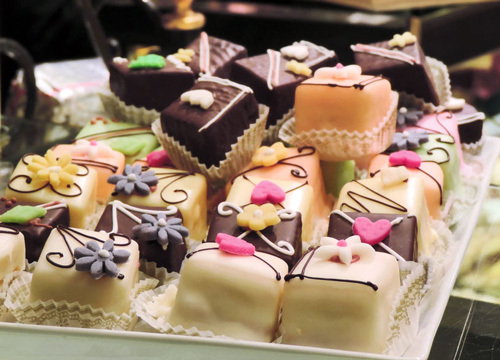 Petit fours can usually be eaten in one or two bites and are traditionally served with afternoon tea or after a fancy meal. Cookie jars are used to __________ cookies. 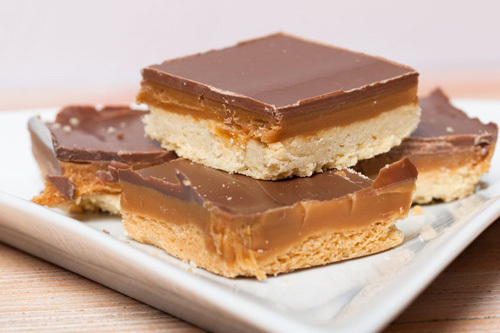 Caramel shortbread was once __________ for special occasions.  __________ the popular belief, the fortune cookie was not invented in China. In the 19th century, doctors believed daily __________ of fruit and cookies were beneficial. 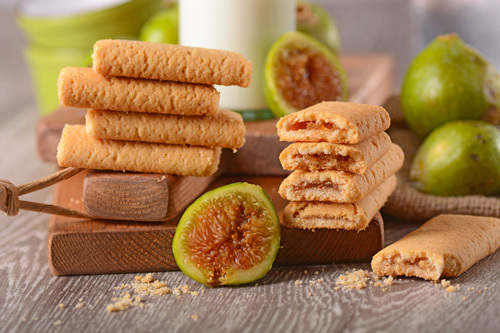 Fig rolls were originally created in order to __________ figs. The caramel shortbread builds __________ the classic shortbread cookie. Macaroons' main ingredients include __________ almonds. Macaroons and macarons have __________ different histories. The Fig Newton was the first to start __________ production of the fig roll. Fig rolls were commonly eaten during __________ journeys. When was the caramel shortbread cookie made when it first appeared? How did macarons become popular? Which ingredient is not found in macaroons? Why did the mass production of fig rolls begin? because many Egyptians migrated to the U.S. Both macaroons and macarons originate from Italy. 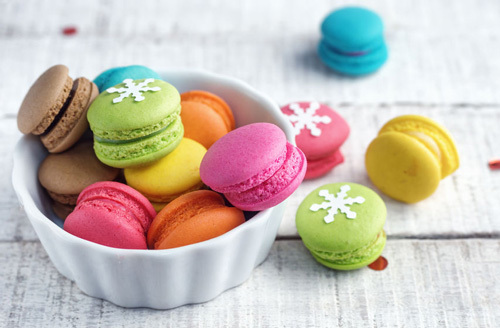 While macaroons originate from Italy, macarons first appeared in France. Fig rolls were invented because Egyptians wanted to preserve figs. Fig rolls were invented because Egyptians wanted to preserve cookie dough. "It is impossible to make madeleines in their traditional shell-like shape." "Nowadays, most people can afford to make or buy the caramel shortbread cookie."